Hannah is a Yorkshire-born writer, working in prose, scripts, and theatre criticism. She is a founding member of community theatre group ‘Iron the Grass Productions’, which she founded with a group of friends on finishing sixth form. The group’s aim was to provide theatrical opportunities, ranging outside performance, for under 26s. For the next three years, she would chair the company alongside completing her BA in English Literature with Creative Writing at Keele University. For Iron the Grass she has written five full length plays, mostly comedies. At Keele she studied the writing of prose and poetry. This prompted the starting of her first novel which is now reaching its third completed draft. It was in her university drama society, however, that Hannah unsurprisingly found her home. 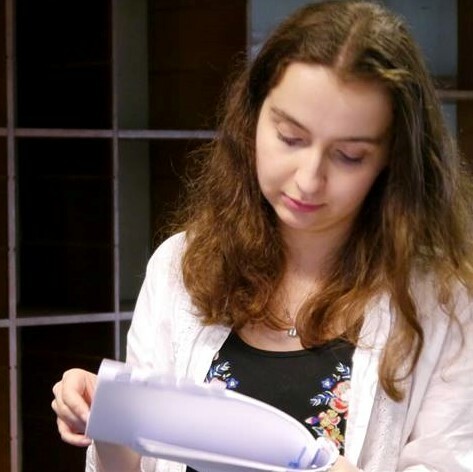 With a small team of students, she adapted and directed the first revival of Jock-on-the-Go for Keele Drama Society in collaboration with the Arnold Bennett Society. In the same year she also made her Edinburgh Fringe debut with the satirical, Rich Hyde, Homicide. A lifetime member of the society, she has also written KDS’s latest Fringe offering, Hangnail for the 2019 Edinburgh season. Now a graduate, she is living not far from her home town of Hull, with several projects in the works. In her spare time she writes short pieces for magazines and competitions. She is always looking for fresh opportunities, especially for experimenting with the theatrical and literary forms and is a critic for A Younger Theatre.